NINE NICKELODEON APPS TO ENJOY THIS HOLIDAY SEASON! Tweet it: Check out @nickasia’s popular apps in 2015 for kids and adults to enjoy this holiday season! SINGAPORE, 11 DECEMBER 2015 – This yearend holidays, Nickelodeon in Asia has hand-picked its popular apps released in 2015 which offer pre-schoolers and gamers of all ages the opportunity to connect with their favourite Nickelodeon characters such as SpongeBob SquarePants, the Teenage Mutant Ninja Turtles and Dora from Dora and Friends: Into the City! Players are invited to check out “Playtime With Blaze and the Monster Machines” which caters to pre-schoolers and comprises five mini games, “SpongeBob’s Game Frenzy” for fans of optimistic sea sponge SpongeBob SquarePants and “Sky Whale” an app featured in Nickelodeon’s brand-new live-action comedy series, Game Shakers, that requires users to bounce a narwhal in the air to catch as many yummy donuts as they can. Here is the list of apps that will keep kids and adults entertained. An app inspired by hilarious and memorable moments in the TV series, SpongeBob SquarePants. With 50 games available, players can collect fast and frantic mini-games and tap, draw, tilt, shake, drag and scrub their way through classic SpongeBob SquarePants moments to save Bikini Bottom. Additional game packs are available as in-app purchases. The app is an endless runner mobile game based on The SpongeBob Movie: Sponge Out of Water released in cinemas this year. In the app, SpongeBob and Plankton are racing to find the lost Krabby Patty formula through three seaworthy locations including Bikini Bottom, Apocalyptic Bikini Bottom and a real-world beach. When he is not running, SpongeBob is flying past obstacles with Plankton’s jetpack, floating in a bubble through a coral forest, racing through Bikini Bottom in the Patty Wagon, or has Plankton jumping through his surreal imagination. When the running gets tough, SpongeBob gets heroic as he transforms into Super SpongeBob. The new upgrade allows SpongeBob to knock through any obstacle in his way without risk. Join SpongeBob and his friends for some fast-paced, bubble-bursting mayhem where players have to pop bubbles as fast as they can for the high score! Tying the show to today’s kids’ love of gaming and apps, the games created by Babe and Kenzie in Nickelodeon’s new series Game Shakers are made available to kids to play. The first game to be released is Sky Whale, featured in the premiere episode. This game challenges players to bounce through the sky and to keep a narwhal up in the air, using clouds and crazy objects to go higher and farther, even into outer space or on an underwater adventure. Watch the show: Game Shakers airs on Nickelodeon on weekdays at 3.30pm (TH), 4.30pm (HK/SG), 5pm (WIB) and 6pm (MY/PH). This is a new and original global app inspired the popular series, Teenage Mutant Ninja Turtles. In the app, kids will have to connect matching puzzle tiles to gain points that will grant them special moves and powers in order to battle enemies in outer space. The series’ first global mobile app, Teenage Mutant Ninja Turtles: Rooftop Run, was #1 among all paid apps in the U.S. and in more than 80 territories around the world when it launched in April 2013. A video of the app gameplay may be accessed from HERE. Watch the show: Teenage Mutant Ninja Turtles airs on Nickelodeon on weekends at 11am (TH/WIB) and 12pm (HK/MY/PH/SG). With the new Paw Patroller vehicle, the pups can now save the day in places way beyond Adventure Bay! Players will keep an eye out for rescue alerts, and go on rescue missions to the Bay, the Ice Fields, and Yumi’s Farm! There are different rescues for each of the seven pups with a variety of fun mechanics, including swipe, tap, tilt, and drawing circles. Rescues feature new tools and vehicles for each pup! The app also includes an awards screen with over 30 awards, tutorials for each game, a parents screen and curriculum guide. Watch the show: PAW Patrol airs on Nickelodeon on weekdays at 7.20am (TH), 8.20am (HK/SG), 9.25am (WIB), 9.30am (PH) and 10.25am (MY). It airs on Nick Jr. at 8.10am (WIB/TH) and 9.10am (HK/MY/PH/SG) daily. The app, based on Nickelodeon’s hit preschool series Blaze and the Monster Machines, offers pre-schoolers five different fun-filled activities to test drive their skills in memory, matching and colouring, set within the world of Blaze and the Monster Machines. Watch the show: Blaze and the Monster Machines airs on weekdays on Nickelodeon at 10.30am (PH) and daily on Nick Jr. at 10.35am (TH/WIB) and 11.35am (HK/MY/PH/SG). 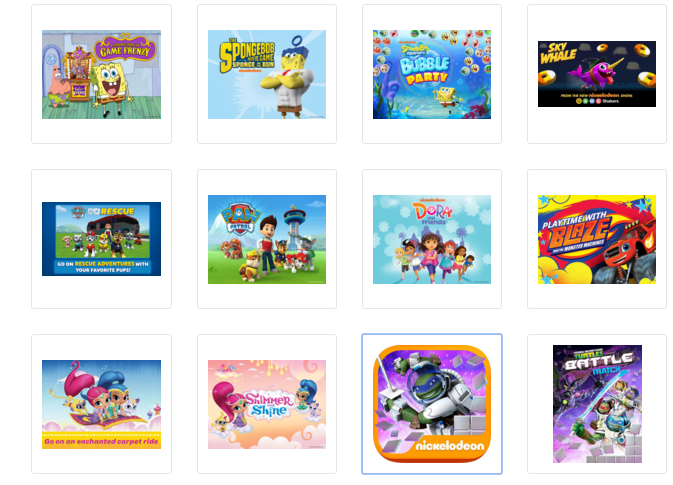 The app, based on Nick Jr.’s animated pre-school series Dora and Friends: Into the Cityinvites kids to become magical storytellers as they play with Dora and her new friends. Watch the show: Dora and Friends: Into the City airs on Nickelodeon on weekdays at 7.45am (TH), 8.45am (HK/SG), 9am (WIB), 10am (MY) and 12pm (PH). It airs on Nick Jr. at 10am (TH/WIB) and 11am (HK/MY/PH/SG) daily. This app takes players on a magic carpet ride through Zahramay Falls! Join genies Shimmer and Shine and their lovable pets as they collect jewels from treasure chests in Zahramay Falls. Swipe up and down to fly through beautiful locations like Genie Cityscape, The Bazaar, Hanging Star Garden, and Beach/Cave. Players gather golden genie coins, look out for obstacles, and use genie magic to get past “blockages.” Through the fun, runner-style game play, players are exposed to patterns, symmetry, and eight geometric shapes (Triangle, Circle, Square, Oval, Hexagon, Rectangle, Pentagon, Trapezoid). Watch the show: Shimmer and Shine airs on weekdays on Nickelodeon at 8.25am (WIB), 9am (PH) and 9.25am (MY). It will also air on Nick Jr. from Monday, 18 January 2016 at 9.40am (TH/WIB) and 10.40am (HK/MY/PH/SG).